Austin College will host the Reverend Dr. Robert M. Franklin Jr. on February 19 to present the College’s 2019 Allen-Head Lectures. He will offer his first lecture, “The Moral Leadership of Young People,” at 11 a.m. in Sherman Hall’s Hoxie Thompson Auditorium. He will take the podium again at 7 p.m. in Wright Campus Center’s Mabee Hall for the lecture “Christianity and Social Justice: Present and Future Challenges.” Both lectures are free and open to the public. 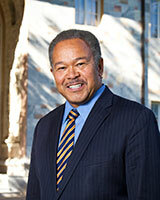 Franklin, President Emeritus of Morehouse College, which he led from 2007 to 2012, is now the James T. and Berta R. Laney Chair in Moral Leadership for Emory University’s Candler School of Theology. In that role, he challenges students to explore the concept of moral leadership in the 21st century in different cultures and contexts in the United States and around the world. Franklin was director of the Religion Department at The Chautauqua Institution from 2014 to 2017 and president of the Interdenominational Theological Center from 1997 to 2002. From 1989 to 1995, he served as the founding director of Candler’s Black Church Studies Program, gaining a national reputation for his work. In 2016, Franklin joined the Human Rights Campaign’s project council on expanding LGBTQ equality and inclusion efforts at Historically Black Colleges and Universities. A distinguished Christian social ethicist and scholar of African American religion and politics, Franklin is the author of Crisis in the Village: Restoring Hope to African American Communities (2007); From Culture Wars to Common Ground: Religion and the American Family Debate, with Don Browning and others (2000); Another Day’s Journey: Black Churches Confronting the American Crisis (1997); and Liberating Visions: Human Fulfillment and Social Justice in African American Thought (1989). During his career, he has served on numerous boards and been very active in the Atlanta, Georgia, community where much of his work has been centered. A native of Chicago, Franklin was a Phi Beta Kappa bachelor’s degree graduate of Morehouse College. He earned a Master of Divinity degree in Christian social ethics and pastoral care at Harvard Divinity School, and a doctorate at the University of Chicago Divinity School, for his work on ethics and society and religion and the social sciences. He was named Alumnus of the Year at the University of Chicago in 2010. Franklin also holds honorary degrees from Bethune Cookman University, Bates College, and Swarthmore College. The Allen-Head Lecture Series was established at Austin College in 1985 through an endowment gift in memory and celebration of E.T. Allen Sr. and Mary Bell Anderson Allen; Mr. & Mrs. E.T. Allen Jr.; and Mr. & Mrs. R.B. Head Jr. of Whitesboro, Texas. The lectures feature nationally prominent speakers in the areas of religion, philosophy, psychology, history, and literature.